A road movie about Indian democracy that follows the trail of Mahatma Gandhis famous salt march of 1930. The film was commissioned by Steps International as part of the `Why Democracy global broadcast TV series, and has been broadcast on several international channels, including BBC World, Arte (Germany and France), SBS (Australia), NHK (Japan). In the early decades of the twentieth century Mahatma Gandhis legacy of non-violent revolution or Satyagraha inspired a mass movement of millions of Indians to rise up against the British colonial state and successfully agitate for the establishment of a democratic and free India. In 2007, the country is preparing to celebrate the sixtieth anniversary of its existence as an independent nation. But what kind of a democracy does India have today? What does it actually mean to live in the worlds largest democracy? 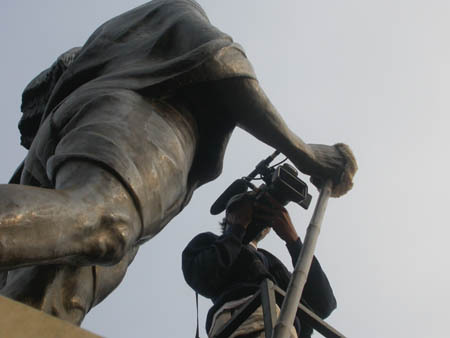 In road-movie style the film crew travels down the famous trail of Gandhis salt march, the remarkable mass campaign that galvanized ordinary Indians to join the non-violent struggle for democracy and freedom almost a century ago. Stopping at the same villages and cities, where Gandhi and his followers had raised their call for independence, the film documents the stories of ordinary citizens in India today. Although inspired by a historical event In Search of Gandhi is not a journey back in time. Instead it is a search for the present and future of democracy in India.